GhostVolt encryption is fully automated at every event, ensuring data security and an uninterrupted work-flow at every point on your network. Automated encryption not only saves time and cost but also eliminates the threat of human error and helps to maintain your data loss prevention policies without intervention. Featuring enterprise level 256 bit AES encryption, GhostVolt provides you with the most advanced security standard to date. 256 bit AES encryption is trusted by both enterprises and governments worldwide in mitigating data breach threats. There are no back doors, so you can be sure your data is invisible to nation-states that are equipping themselves for industrial espionage and theft of intellectual property. GhostVolt has a complete user management system allowing full control of user permissions. The multi-level permissions manager can be fully customized for the needs of your team or business structure. Users with higher administrative access can review or control the movement and status of any digital asset, as well gather full insights into your users, with detailed reports. GhostVolt’s reporting engine offers detailed insight and easy retrieval of data relating to the activities across your GhostVolt network. 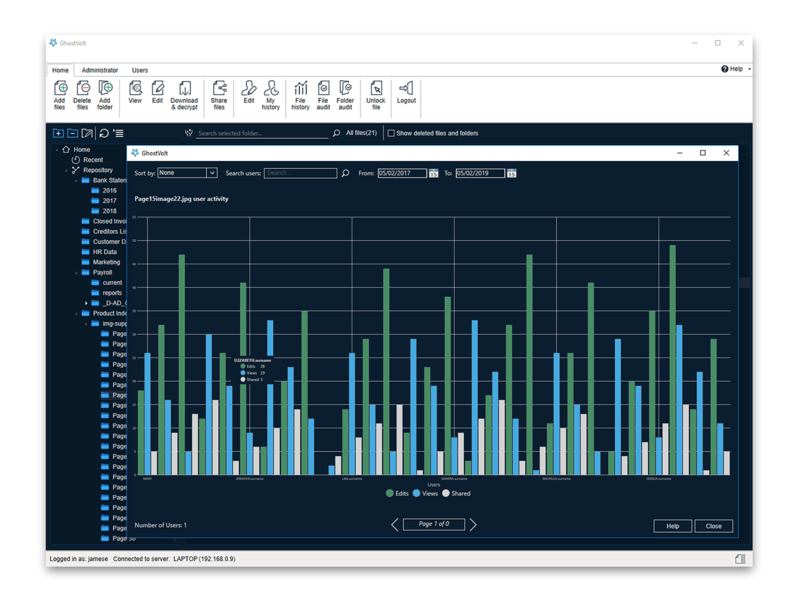 GhostVolt meets the obligations that come with managing valuable and sensitive data and that understanding is critical to the way we have developed our reporting tools. Industry security standards such as HIPAA and other compliance measures have informed the development of GhostVolt to assist your organization with meeting the latest compliance expectations. 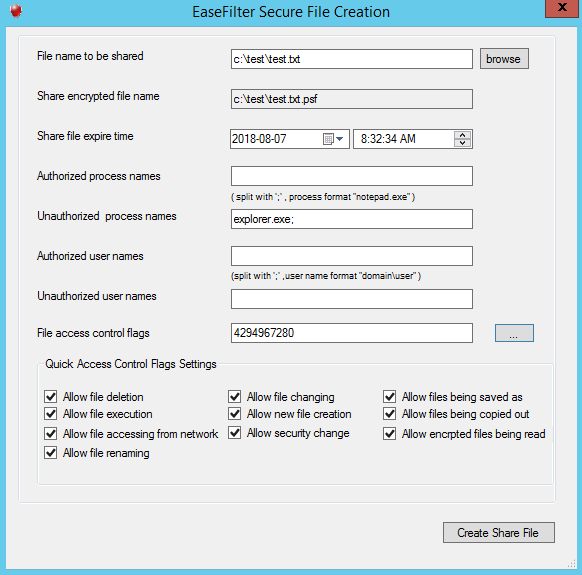 Create Windows application to track, control and secure your files in one step with EaseFilter file system filter driver SDK. Dynamically control file access, grant or revoke the file access to the shared files anytime, anywhere even the files were distributed to the users or lost. Prevent the confidential files being copied out with digital right management embedded. Secure File Sharing With Digital Rights Management.Safeguard file sharing without boundaries. Secure File Sharing combines AES 256 bit encryption with digital rights management to give businesses persistent control over all stages of its life,enables employees to share files with anyone, via any method, without compromising business data or risking liability from data loss. By leveraging the digital rights management, encryption keys and access policies are stored in the remote central server, so your data is never at risk of being unlocked, stolen or misused, either by internal threats or external attacks.Your files remain control wherever you share them. Wherever your data is stored, on the cloud, on your laptop, on a USB drive, on a backup disk or on someone else’s computer, only you, and those you authorize, can view the contents of those files.